Welcome to our first Featured Pawsome Pet of the year 2016! Today's interview is with a very handsome and popular mancat named Ernie. He has expressed his excitement for being the first interviewee of the year already. Ernie is a 10 year old black shorthaired cat. He is an "Island Cat", although his island is not of the tropical variety. "What does it mean to be an Island Cat? Well, number one, you hafta be a cat. And, number two, you hafta live on an island. And we do. It’s not a tropical island or anything like that. It’s called Grosse Ile which is French for Big Island. And it’s just south of Detroit, MI. What’s really cool is that we’re not far from Canada. We can see Canada from our island! The third thing about being an Island Cat is that you hafta be spoiled rotten. And I definitely am!" At about 6 months old, Ernie found himself in a shelter with his sister looking for a forever home when his previous owners could no longer keep them. He waited and waited for the perfect home. "My sister found another home pretty quickly, but I wasn’t as fortunate and I was in the shelter for a while. And then my lucky day came. I was adopted into the best home a cat could ask for because I got to be an Island Cat!" While there are probably about a thousand things that make Ernie a Pawsome Pet, I wanted to know what he thought makes him so pawsome. "I’ve got lots of character. I’m always doing something that makes my mom laugh. Like dive-bombing under my boogie mat and hiding under it for hours at a time. And I love cuddling with my mom. The dad-guy says I’m a mama’s boy. But I don’t think there’s anything wrong with that. J"
"I like all foods really. I’m not real picky. I do love treats, though! My favorite treats are those freeze-dried chicken ones. I like to do a lot of fun stuff. Though the mom doesn’t think that some of the things I do are fun. I love to unroll the toilet paper in the bathroom and the paper towels in the kitchen. I also love to mess up the paper napkins that are in a holder on the kitchen counter. Do you think I have a paper fetish?" While some people might say that black cats are unlucky (which totally is NOT true), Ernie says being a black cat is his favorite characteristic. Being a black cat does have its perks after all. "I’m a black cat. Now some would say that’s not a good thing to be. But I’m glad that I’m a black cat. I’m sleek and shiny. And I can hide in dark places and not be found because I blend into my surroundings so easily." "I’m a polydactyl cat. That means I have extra toes. I’ve got 7 toes on each of my front feets and 5 on each of my back feets. It’s not unusual for a cat to have extra toes on his front feet, but extra toes on the back ones isn’t as common. I think having all these extra toes makes me extra special!" Ernie shares a blog with his 2 cat siblings, Wally and Zoey, called The Island Cats. The 3 of them are quite amusing, so you should all stop by there to check them out. You can also find Ernie on Facebook, Twitter, and Instagram. Ernie would love to have you visit! Special thanks to Ernie for being the first Featured Pawsome Pet Interview of the Year! It's so nice to learn more about you here today, Ernie! We think you are an exceptionally handsome mancat and look forward to reading about your adventures each week! That was a fun interview. Thanks for introducing Ernie. He looks so cute on the photos. We are are big Ernie fans here and the Island Cats are all super special!!! Aaaaaaaw Ernie we fink you are indeed pawsum. Fanks fur sharin' da Island Cats, we luv 'em. You sure are and thank you very much Ernie! How fun to read your interview, Ernie! You and Wally and Zoey were some of the first kitties Sparkle got to know when she started hunting out other cat blogs. We love Ernie and all of the Island Cats! He is definitely one handsome guy. We enjoyed learning some things about him that we didn't know! We had a cat that extra toes on the front and back paws. His name was Mitten because his front paws looked like a mitten. Have an awesome life Erie! What a pawtastic interview, Ernie! We didn't know you had extra toes (which we think is so cool!) We are so glad we became friends. I didn't know either, but I'm not sure how I could have missed them. Those are some big paws! What a great interview! I'm a fan of Ernie's, and I loved learning more about him here. This was a great interview! We love Ernie. These pictures really show his fun side and how truly adorable he is. Ernie is extra special indeed!! Nice to learn more about you Ernie. I am sorry you and your sister got separated, but I am glad you found such a loving home. We're all about black cats in my house, Ernie!! This is a great interview and its always fun to learn more about our fellow bloggers!!! Ernie, that is one terrific write up about you. We love black cats too and think they are some of the very best. 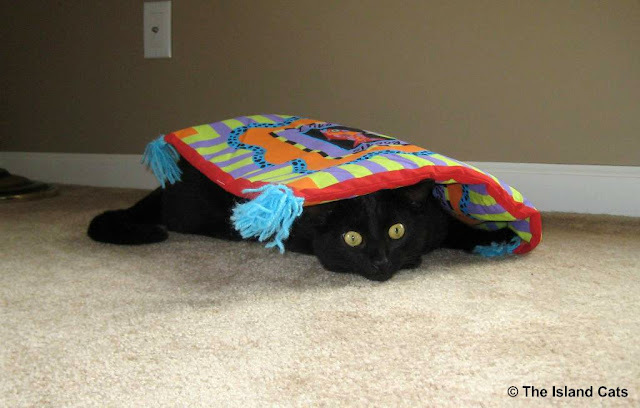 Love the way you hide under your mat. Our Black cat whose name is Black loves to do the toilet paper too. Wow that is fun. I featured a lot last year :) But they may be infrequent this year. Great interview! I learnt a few things I didn't know about my pal!! We liked the part that you said you can see Canada from your place on 'The Island'...cause our meowmy is from Canada...Hooray! You sure gave an interesting interview. Your extra toes make you have mitts, well, it looks like that, MOL! Nice to meet you Ernie! Ernie, we loved your interview and Mom thinks you could ask for your own paper to play with... you needs to have fun with them extra toes! btw - Guero am feeling soo much betters - he gotted his easy on today and did a sleepy selfie. An island cat, eh? I hope we get to meet many of them on our travels. Thanks for introducing us to Ernie. We LUV Ernie. And Wally. And Zoey. They geet to live on an Island ane EVERYthing!! Ernie is super handsome and looks quite happy! Woo Hoo Ernie!! Pawsum innterview mee furend!!! You can see yur Burmesey heritage inn yur fotoss'...you look so much like mee Pappaw King George!An wee luvss yur boogie mat foto...mee must try that sumtime! Hurray for the Island Cats! We love Ernie*, so it was so fun to learn more about him today! Ernie what a great interview!!!! You did a great job! Love your photo shoot too! LOVE the interview! Ernie is SUCH a good looking boy cat!